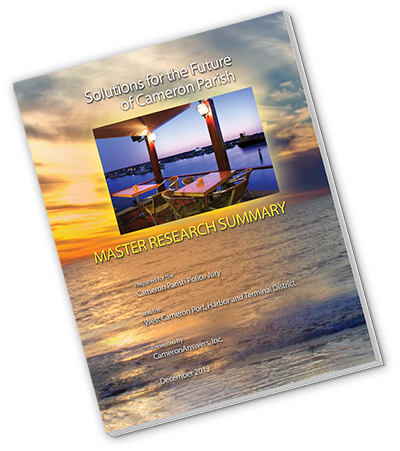 In February 2013, we formally asked the Cameron Parish Police Jury to fund four research studies we felt are needed in order to entice investors, developers, government, NGOs and financial institutions to move forward, as each group will require valid, dependable background information to make decisions. Stated another way, we have to convince everyone that Cameron is worth future investment. Our fieldwork began that April. 1. What do the residents and former residents of the parish want to have happen here? 2. What if we could build a hotel, restaurants, retail, even a marina? Is this feasible? 3. What do the experts think of Cameron’s suitability for such projects? 4. And, finally, what would the economic impacts be? We invite you to download the entire document and learn what we have learned.